Natural range Honshu, Shikoku, Kyushu and peripheral islands around those mainlands. Range in Japan Hachijojima Island. Date Given several descriptions on literatures, introduced between 1911 and 1924. Route Unknown. possibly deliberate introduction as education material or accidental introduction with some transport. Impact Uknown. 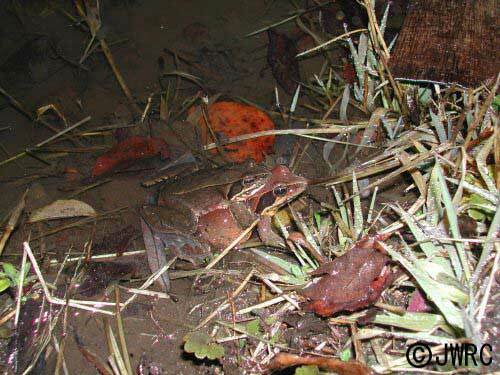 Alhtough this species may be a predator for ground dwelling invertebrates, the impact may be little due to small density of the frog. Affected organism: Ground dwelling invertebrates. Goris (1967) The reptiles and amphibians of Hachijojima Island. Japanese Journal of Herpetology. 2(3):25-30. This species was drastically declined in 1960s by the introduction of the weasel Mustela itatsi.